Kevin Pauwels secured his second UCI World Cup title in Hoogerheide, but it was Dutch champion Mathieu van der Poel who was the star of his father's 'show' – the GP Adrie van der Poel - very much on his home soil. World champion Marianne Vos and Katie Compton both suffered dramatically in the women's race as Eva Lechner took the win and Sanne Cant the World Cup overall. Photos: Konrad Manning. Mathieu van der Poel (centre) and brother David (left) about to finish warming-up in front of their father Adri (right). Gianni Vermeersch chased Van der Poel securing a podium place and a spot on the Belgian team for the Worlds. Sven Nys leads the pursuit of Van der Poel and Vermeersch. The battle for second place was won by Wout Van Aert. Belgian champion Klaas Vantornout failed to finish - presumably in order to conserve energy for the Worlds. Tom Meeusen slipped backwards but was rewarded with a place in the Belgian team for Tabor. Kevin Pauwels (right) won his second World Cup title - his first was in 2011-12. Sven Nys and Francis Mourey battle for sixth place. American champion Jeremy Powers had another good World Cup race finishing thirteenth. Radomir Simunek (3) won this four-up sprint from Gert-Jan Bosman (27), Niels Wubben (25) and Bart Wellens (79). Van der Poel exuded confidence after his win, but as Wout Van Aert (left) told reporters, "Tabor (Worlds) is another day, another course." Italian champion Eva Lechner once again proved her love of the Hoogerheide course where she won silver in the Worlds twelve months ago. Sanne Cant (centre) was a worthy winner of the World Cup after finishing fourth behind Katerina Nash (40) and Pauline Ferrand-Prevot (17). American champion Katie Compton's performance was again restricted by asthma problems - here she follows Luxembourg champion Christine Majerus. World champion Marianne Vos was also down the field suffering from a hamstring injury. Jolien Verschueren has been one of the revelations of the season and finished eighth in Hoogerheide. French champion Pauline Ferrand-Prevot will be one of the favourites for the World title in Tabor next weekend. Under the weather British champion Helen Wyman finished ninth one place ahead of Nikki Harris (a winner the day before in Rucphen). 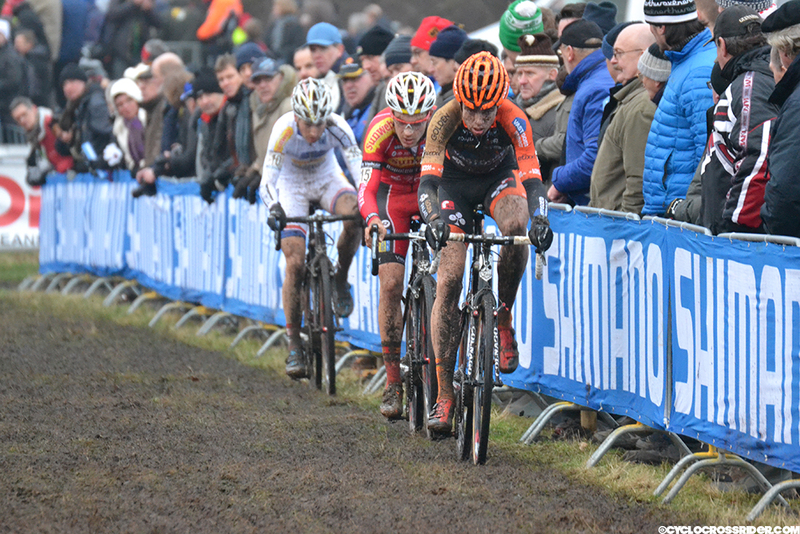 Marianne Vos has won seven World 'cross titles but an injury clearly makes her vulnerable in Tabor next weekend. Eva Lechner's attacking ride gave her an 18-second winning margin over Katerina Nash.